I started Fig Tree as a concept to work with organisations in delivering Strategic Marketing and Digital outcomes for marketing teams. With the emergence of social media and digital integration, the business grew with new team members and we deliver on strategic brand and marketing, creative design, digital and database development, social media and online advertising. Working across industries, whether in retail or business to business, digital outcomes have strategic and daily implications for business. I love delivering a strong outcome to our clients. We create lasting, fun business relationships delivering quality work that we are proud to do. Bring our best to the job each and every day. Love the buzz of the team in the office and the integration of great talent. It was for my clients of course, posting image or video to tell a brand’s story. Especially one where there is a need to raise funds for vital research. Finding success with storytelling via social media is the best! Do you believe women can have it all? Why or why not? I heard an insightful comment from Annabel Crabb saying “If having it all means you are doing it all, then this isn’t going to happen”. It struck me as a core expectation that when you say can you have it all, you are expecting yourself to do it all – that’s just not possible. Define your own values of ‘it all’ is what’s important, and these boundaries will alter throughout your life stages. What is the hardest lesson you’ve learnt and how did you learn it? When I started the business I worked as a solo and when the business added more team members the biggest lesson was to let go of the details. Give responsibility where it will blossom into new ideas and outcomes, this is my lesson. I am reminded of it every day. What is the one golden piece of advice you could offer other women in business? Follow your own path. Read, listen and learn from others, however in the end it’s your journey, and you’re the driver of your own decisions. What are you most pumped about right now? Launching client’s new online store, digital and social media fundraising campaign for not for profit client and developing a new brand direction. With technology and consumer behaviour changing at such a rapid rate, these 3 tips will keep you on task. 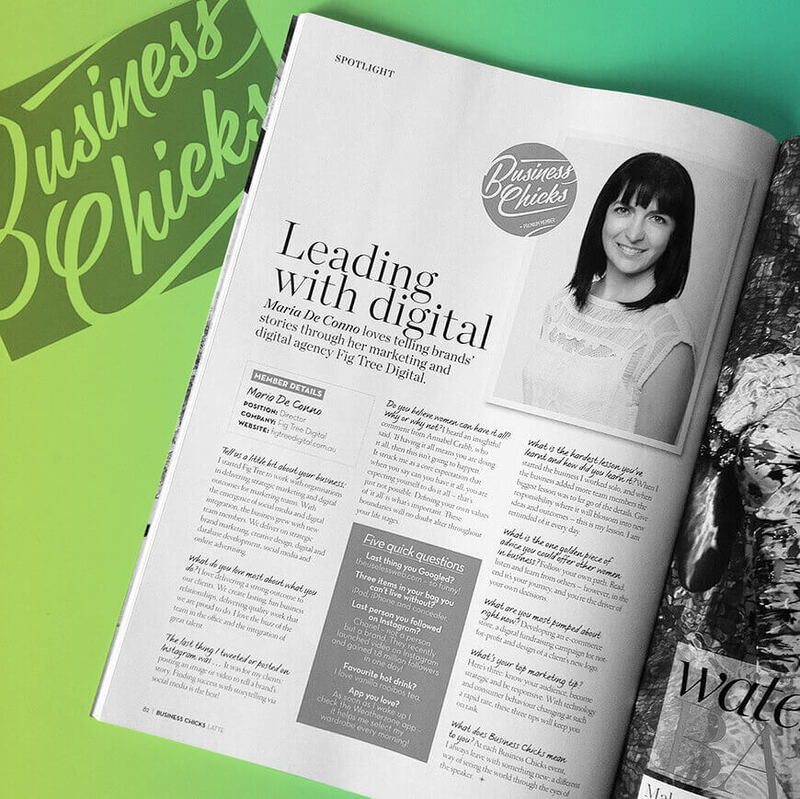 Article first appeared in Business Chicks Magazine.